The employment of a strong contrast between dark and light is what characterizes chiaroscuro as applied to art, which greatly affects the whole composition of a painting. Its application creates a strong sense of volume to model figures and objects as three dimensional. The effects of light and shadow could be very stark or very subtle. Chiaroscuro is also applied in photography and cinema for great dramatic. Chiaroscuro started during the Renaissance. At that time it was used in drawing on colored paper, using the paper’s base tone and working toward light, which was achieved by the application of white gouache. When the artist was working toward dark, watercolor, bodycolor or ink was used. The inspirations for the technique were the illuminated manuscripts. At first, the term chiaroscuro only applied to those drawings on paper. Today, it encompasses a wide range of artwork that depicts strong lighting contrasts between light and dark parts of the artwork. The delicate and very subtle modeling chiaroscuro effect was best exemplified in the painting by Raphael called La Fornarina, which can be seen on the right arm, breast and shoulder of the model. In chiaroscuro’s technical use, it is the effect that is achieved to create three-dimensional volume through the clever use of light and shadow through shading. In Raphael’s painting, the light was coming from the left, softly illuminating the left side of the exposed shoulder and arm of the model. The delicacy of the application of the chiaroscuro technique shows the soft roundness of the upper arm, the gentle slope and trace of collarbone and the lush fullness of the model’s breast. The softly-lit left side was brought to focus by the strength of the shadows, via the darkness of the foliage that served as the background. When applied to prints and drawings, modeling chiaroscuro is achieved by using hatching (parallel line shading) while stipples (dotting effects), surface tone and washes are employed in printmaking. Compositional chiaroscuro started its development in northern Europe due to a very popular mystic at that time, Saint Bridget of Sweden and her vision of the Nativity of Jesus. Her vision of the infant Jesus emitting bright, almost luminous light, spurred the creation of several paintings focused on the said subject, just like the image above, the Adoration of the Shepherds by Antonio Balestra. Eventually, other light sources were greatly reduced, emphasizing the main source of illumination, which was how chiaroscuro was used throughout the Baroque period. For Flemish painter Hugo van der Goes and the artists that followed him in the 15th century, the use of the single light source, was more evocative of calm and stillness. However, during the Baroque period, it was mainly used for dramatic effect. During the 16th century, stronger chiaroscuro became almost the norm in paintings created in Mannerism and Baroque periods. Divine light was still the main source of illumination, although sometimes the light source was not enough. This effect was seen in the compositions of Veronese and Tintoretto and the artists after them. Italian painters Caravaggio, Giovanni Baglione and Ugo da Capri developed the compositional device that used a single, narrowed and often hidden source of light to illuminate dark subjects dramatically. 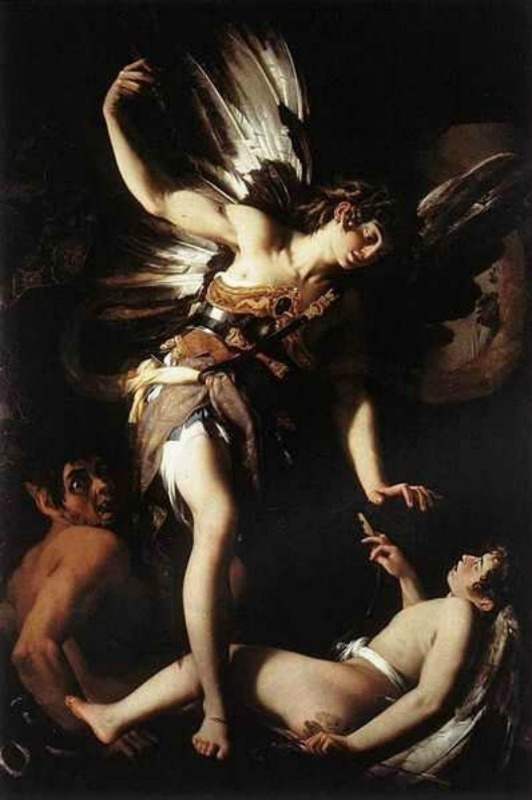 Caravaggio was credited for developing tenebrism, the style of painting where the chiaroscuro was more pronounced. This was also called ‘dramatic illumination.’ This became a dominant painting style in the 16th century among the Baroque artists. Artist Jusepe de Ribera and his art disciples were the proponents of tenebrism in Spain and in Naples, which, at that time was ruled by Spain. Fire and moonlight were the source of lighting for German artist Adam Elsheimer, who lived and worked in Rome. But his style had implicitly subtle interest and detail in the darker areas, in contrast to the works of Caravaggio. There two artists strongly influenced the work of Peter Paul Rubens, who used tenebrism to achieve dramatic effects, especially in his early 17th century painting, The Raising of the Cross. Another proponent of chiaroscuro and tenebrism was Baroque artist Artemisia Gentileschi, who, today is hailed as one of the most accomplished painters in the group that came after Caravaggio. She was the first female artist to become a member of the Accademia di Arte del Disegno, which is located in Florence. Several prominent artists in that era experimented with the chiaroscuro and tenebrism techniques. Some of Rembrandt’s works in the 1620s also showed his interest in the technique.